I updated the web site with new people on the contact pages. I also added other projects to the projects page. COTTAGE 0.05 IS OUT !!! This version supports 78 ROM sets that you can play online. COTTAGE 0.04 IS OUT !!! This version supports 54 ROM sets that you can play online. COTTAGE 0.03 IS OUT !!! This version supports 37 ROM sets that you can play online. We have just added a general Forum for The Java-Emu Portal! You can also discuss about your favorite java emulators and ported games. Do not hesitate to visit this new forum! Here is already a new version thanks to Erik Duijs and Arnon Cardoso fixes. I am still progressing with the Automap feature for DoomCott. We just released the first version of CottAGE. This project is now Open-Source ! CottAGE (Cott Arcade Generic Emulator) is a multiple arcade emulator in java. This version supports 23 arcade games that you can play online. You can also download the CottAGE 0.01 release package as well as the source package on the Official site. I am nicely progressing with the Automap feature for DoomCott. I plan to work on adding monsters, objects and other things on the map. Israel dos Santos Paixão Jr joined the Java-Emu Team. He will work on HeretiCott so expect screenshots in a few days! HeretiCott is a java port of the PC game Heretic, a nice medieval-fantastic First Personal Shooter game. 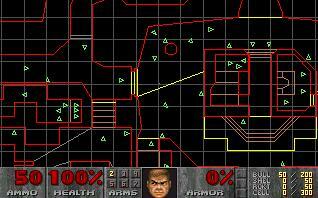 I am still working on the Automap feature for the Java Doom port, DoomCott. Some nice progresses with the Doom port in Java, DoomCott. I added support for the Automap feature. I hope to finish this part and start working on 3D rendering itself. I also added a small review of the program. I added many non-Java-Team projects to the projects page. I updated the web site with links and contact pages. 04/27/2002 :: Java-Emu is now online ! The Java-Emu Portal is now online ! Huge thanks to Karine for the nice web design. The WolfCott project has a new homepage. The DoomCott project has a new homepage.